In Canada, the term "COLLEGE" usually refers to a community college or a technical, applied arts, or applied science school. These are post-secondary institutions granting certificates, diplomas, associate's degree, and bachelor's degrees. In Quebec, the term is seldom used and is specific to the Quebec education system. In Ontario, British Columbia and Alberta, there are also institutions which are designated university colleges, as they only grant under-graduate degrees. This is to differentiate between universities, which have both under-graduate and graduate programs and those that do not. In contrast to usage in the United States, there is a strong distinction between "college" and "university" in Canada. 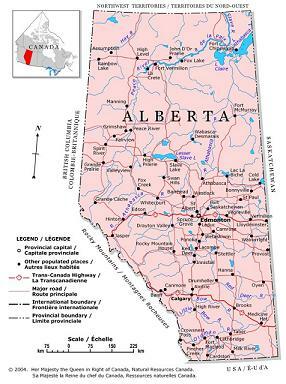 Click on the Alberta Map image to enlarge.